A fuseFuses are safety devices, which protect electrical appliances by preventing too much electric current flowing through them. The fuse is a thin wire inside a protective case. If too much electric current flows through the wire, it melts and stops the current flowing. is a safety device which stops electric currentElectric current is a flow of electric charges (electrons). flowing if an electrical appliance goes wrong and causes the electric current in the circuit to get too big. 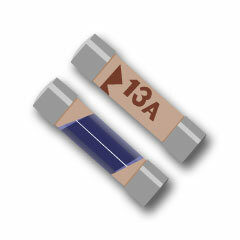 Three types of fuses are found in mains plugs: 3A, 5A and 13A. Each fuse contains a special piece of wire which melts once the current reaches the limit. When the wire melts it makes a gap in the circuitA collection of wires and electric components connected together in such a way that electric current can flow through them. and so the current stops flowing. The mains electricityElectric current supplied to our homes from the national grid. circuits in our homes are also protected by fuses. These are usually in a fuse box near the electric meter. If there's a problem with an electric appliance the fuse in the plug might 'blow' and sometimes, the fuse in the fuse box blows too. Some homes have circuit breakers instead of fuses. They do the same job as fuses but they don't rely on melting wires. There are usually quite a few circuit breakers - one for each of the mains electricity circuits in the home. 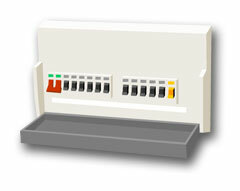 Find out more about the mains circuits in your home. asNever take electric appliances into the bathroom. Water conducts electricity - you could easily be electrocuted. Save energy - Use energy efficient light bulbs and, when you are leaving a room empty, remember to turn the lights off. All electrical appliances are rated in watts (W) or kilowatts (kW) ( One kilowatt is the same as 1,000 watts). You can use the ratings to compare how much electricity they use. Electricity used at home is metered in 'units' or kilowatt hours (kWh). Each unit is the same as 1,000 watts of electricity used for 1 hour. 1 unit = 1kWh. Save energy - Finished playing on your games console or other equipment? Remember to switch off! Michael Faraday (1791-1867) is one of the most famous people involved in the discovery and harnessing of electromagnetic force. In August 1887 the London Electric Supply Corporation commissioned Ferranti to build the first power station. Today our electricity supply is still based on the system that Ferranti designed. In the 1780s, Alessandro Volta invented the first battery - all because of Luigi Galvani's experiments with dead frogs. Thomas Alva Edison 1847-1931 is one of the most successful inventors ever, applying for over 1,300 patents by 1910, mainly to do with electrical or mechanical development. High voltage electricity is carried across the country by pylons and 'stepped down' for domestic use at substations. The National Grid supplies electricity all over the country. In 15 minutes, the sun radiates as much energy onto Earth as all the people on the planet during an entire year. Just imagine if we could channel the sun's energy effectively! The first turbine engines were designed by Charles Parson (1854-1931). Today turbine engines used to generate electricity are still based on his designs. What is a watt? Why is it called a watt? It's a unit measuring electric power, named after James Watt (1736-1819). Electric shock victims often can't let go of the thing that is passing the electric current into their body. That's because the electricity makes their muscles contract. In 1831 Michael Faraday demonstrated electromagnetic force at the the Royal Institution in London, a famous centre for scientific education and research. Save energy - Don't forget to switch your TV and computer off when you have finished using them. Save energy - Make sure the dishwasher and washing machine are full before you turn them on and use the lower temperature settings. Michael Faraday (1791-1867) was the first person to create a way of generating a constant current of electricity. His invention led to the power stations we know today. Today we still use words that Benjamin Franklin (1706-1790) introduced: battery, conductor, positive and negative charge, electric shock and electrician. Benjamin Franklin (1706-1790) developed the first lightning conductor after flying a kite in a thunderstorm. A spectacular but very dangerous experiment! Fossil fuels won't go on for ever - gas could run out in 40 years. Save energy - Boil just enough water for the number of hot drinks you want to make - that way you won't waste energy. In 1800 Alessandro Volta built the world's first battery from discs of copper and zinc sandwiched between cardboard moistened with a salty water. An electric eel can produce powerful electric shocks: up to 500 volts and one ampere of current (in other words, 500 watts). At Deptford in 1891, electrical engineer Sebastian Ziani de Ferranti (1864-1930) designed and built the first power station and supply network. His basic system is still used around the world. The Italian inventor Alessandro Volta (1745-1827) is best known for his work on electric current. Fossil fuels won't go on for ever - oil could run out in 30 years. Modern power stations and steam turbines use the same engineering principles that James Watt (1736-1819) applied when he invented the steam engine. In 1771 Luigi Galvani used electricity to make a dead frog's leg jump! The ampere is named after André-Marie Ampère (1775-1836). He discovered many of the mathematical principles of electromagnetism. Fossil fuels won't go on for ever - coal could run out in 250 years.